Will the Tattler rubber gaskets work with really old glass top jars? 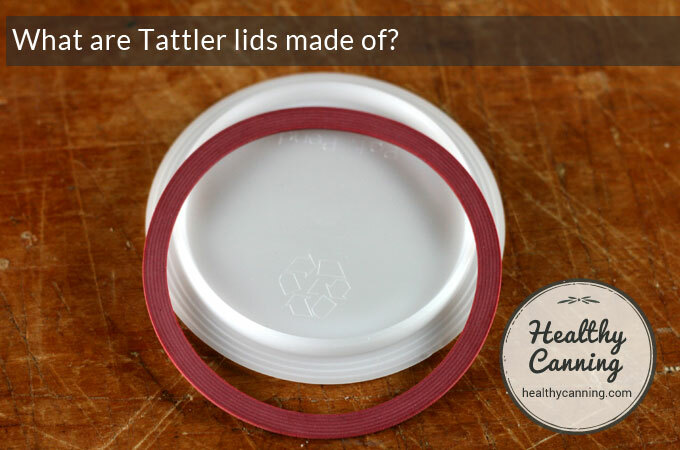 Is there any limit on how often Tattler lids can be re-used? What kinds of canning can Tattler lids be used for? What are Tattler lids made of? What colours do Tattler lids come in? What is the difference between original and “new” E-Z Seal design? What is the success rate with Tattlers? 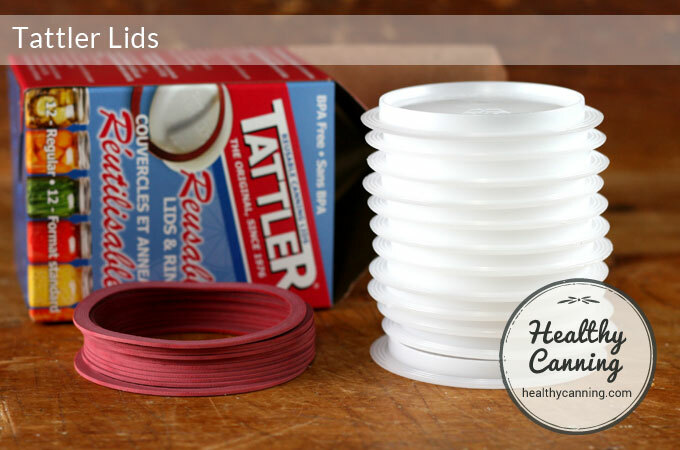 How do you use Tattler lids? How soon to get jars with Tattler lids out of the canner? 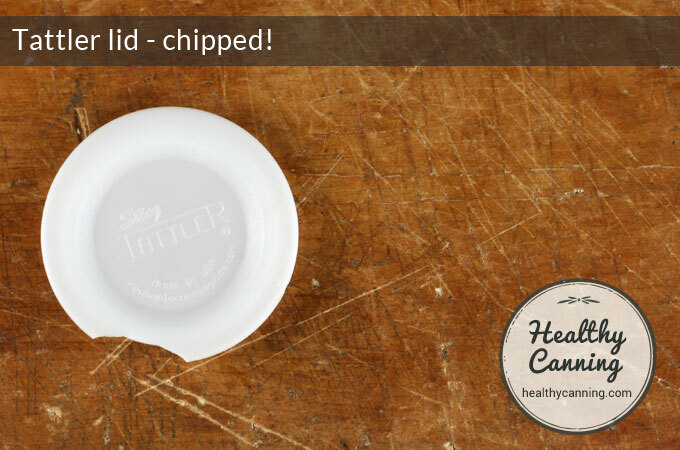 Why did my Tattler lid fail to seal? What to do about gifting jars when you are using Tattler lids? Are Tattler lids “officially” endorsed? Tattler reusable canning lids are two-piecsee plastic lids for mason-type preserving jars. Both parts are reusable. Whereas current standard metal lids for mason jars are two pieces physically joined together — an actual lid, plus a thin rubber gasket going around the edge glued onto the lid — the Tattler lid closure system keeps the actual lid and a thicker rubber gasket for the edge separate. Each “lid” consists of a flat disc plus a red “rubber” ring. 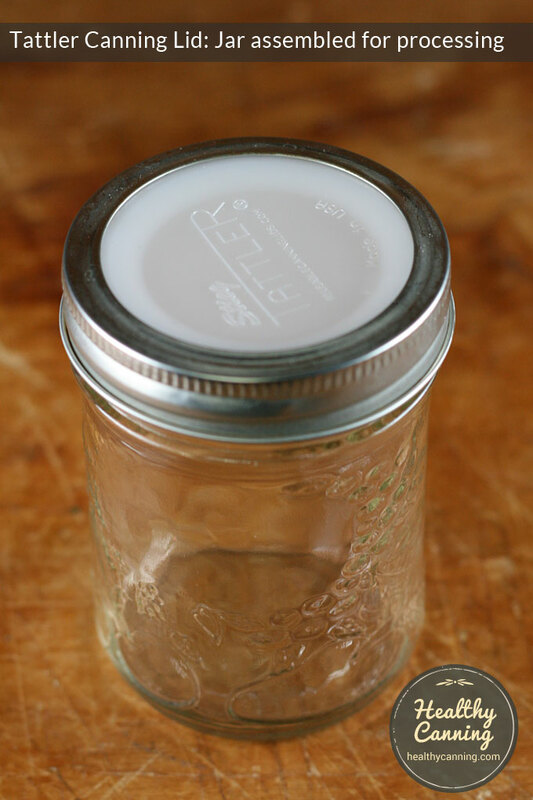 Like a metal mason jar lid, Tattlers also require a metal screw-on canning ring to hold the lid in place during processing of the jar. After processing, the ring is no longer required to hold the lid in place: a vacuum seal does that. If your jars will work with standard regular or wide mouth metal lids (from Bernardin, Ball, Kerr, Golden Harvest), then they will work with Tatter lids. So it’s easy to test: just see if your jar will work with a standard regular or wide mouth metal lid. Kilner regular mouth preserving jars from England. wide mouth Leifheit jars from Germany. 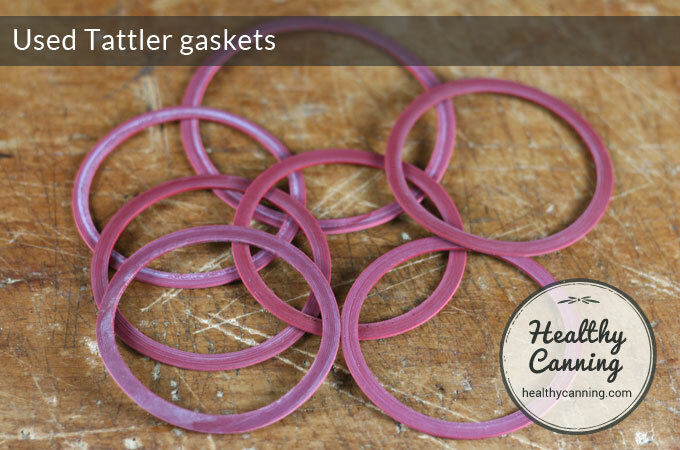 The Tattler rubber gaskets will only work with Tattler lids. If you have really old jars with glass (or combo glass / metal lids), and are determined to use them (they are now recommended against for home canning), then you need to be looking for “fruit jar rings”, such as those made by Viceroy and sold in yellow boxes. Lehmann’s in the States has them; in Canada, Home Hardware carries them. The red rubber gaskets in theory will wear out sometime but can be re-used many, many times. Tattler lid sales literature says the product is “indefinitely reusable.”  Accessed May 2015 at https://reusablecanninglids.com/How_Do_They_Work_.html Testimonials cited on their web site say that some people have been using the same lids and rings for nearly 20 years. Accessed May 2015 at https://www.reusablecanninglids.com/Testimonials_2B2A.html . 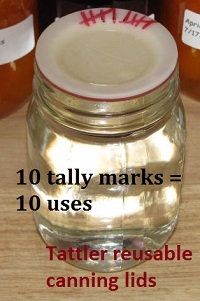 At one point, a Tattler rep pressure canned jars of water 10 times over a period of a few weeks, placing a red ink tick mark on the lid for each of the 10 uses / years presuming once a year. There was no sign of failure or weakness in either the lid or gasket — both were perfectly good for continued further use — and the testing was ended there. A picture showing the lid ticked 10 times was posted, and “10 uses” was then talked about, and cited by others from there. Concerning the rubber rings I can honestly not say how long they will last. Other than the testimonial on our FB page from the person who said they purchased in 1979 and their rings were beginning to get ‘to slack’ to use we do not have any other such history. It does depend on the care taken with them. As for their resilience, I have a box of approximately 20 thousand unused, purchased in 1976, that remain in an uncontrolled environment, that are pliable enough to use today. As for the 10 year thing that was a number [the rep] pulled out of the air…” Loren Stieg to HealthyCanning. Facebook PM conversation November 2016. So the white part of the lid will last forever. The red gasket rings have a minimum of 10 uses, but that is a bare minimum number, and are good likely for many, many uses beyond that. The actual plastic lid disc is made of Polyoxymethylene Copolymer (POM) (aka Acetal Copolymer.) The red rubber rings (gaskets) are made of food grade nitrile rubber and contain no latex. Both are BPA-Free. Nitrile is an oil-resistant synthetic rubber. There is a trace amount of formaldehyde “Polyoxymethylene Copolymer”, but that trace amount would only be released if the plastic were heated to temperatures above 238 C (460 F), which won’t be encountered in home canning  Accessed May 2015 at https://www.reusablecanninglids.com/BPA_Free.html . Despite this, Lisa Rayner, author of The Natural Canning Resource Book (2010), remains concerned about the formaldehyde gas in the plastic. She had the lids analysed, but confesses that the analysis was done by her dad (pp 60 to 61.) Sometimes citing her, a small handful of bloggers say their concerns are unallayed. Other bloggers have countered that metal lids if heated high enough can produce dangerous molten metal. 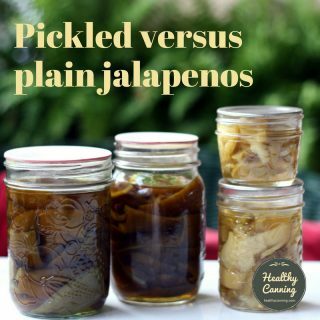 They point out other canning dangers: your pressure canner could explode if super over heated, your mason jars when dropped can produce dangerous glass shards, and metal canning funnels can become scaldingly hot when you are packing your hot jars with hot foods. The standard colour for Tattler lids is white. 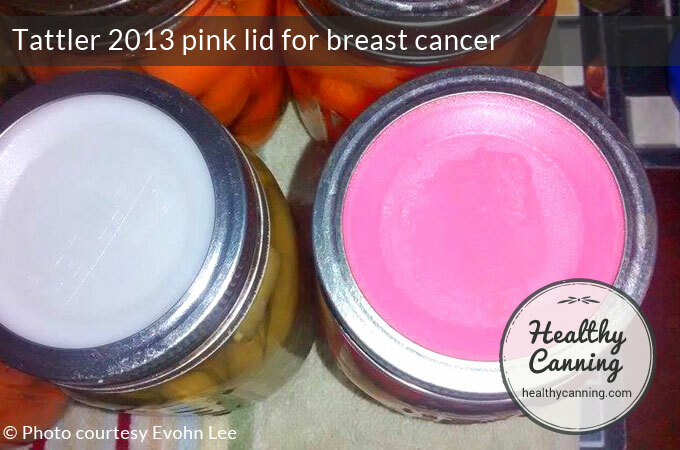 In October 2013, they issued a limited edition of pink-coloured lids to raise money for breast cancer; 35% of the sales went to charity. The pink was made only for that fundraising campaign; to buy the pink lids now you need to look on eBay, etc. The new E-Z Seal design also offers a choice of colours, white or mint-green; the original design offered only white. The original design, as of 2016, is no longer being made or sold by Tattler. The boxes for both the classic design and the new E-Z Seal were identical at first, and some older stock may still be floating around out there (as of 2016), so you need to make certain at time of purchase that you are getting the new design if that is what you want. If you see the choice of colour (white or green), you are likely looking at the new design. If you don’t see assurance in writing, and it matters to you, then inform yourself somehow before buying. As of 2016 at least new boxes were being used, which have E-Z Seal in a starburst on them. Some third-party vendors get confused themselves about whether they are selling the classic, or the new ones. So if you buy from them, you really have to grill them in advance, and ensure that there is a money-back guarantee including shipping costs that they have sold you the version you wanted. The new lids have the words “E-Z Seal” engraved on them. On the top side of the lid, which is contacted by the metal band, you will see a portion of that surface lower than the rest of the diameter. It is actually .025 (twenty five thousands of an inch) lower. Tightened properly this ‘gap’ between the lid and metal band allows the lid to flex slightly when heated in the canner, allowing pressure to escape in that area. 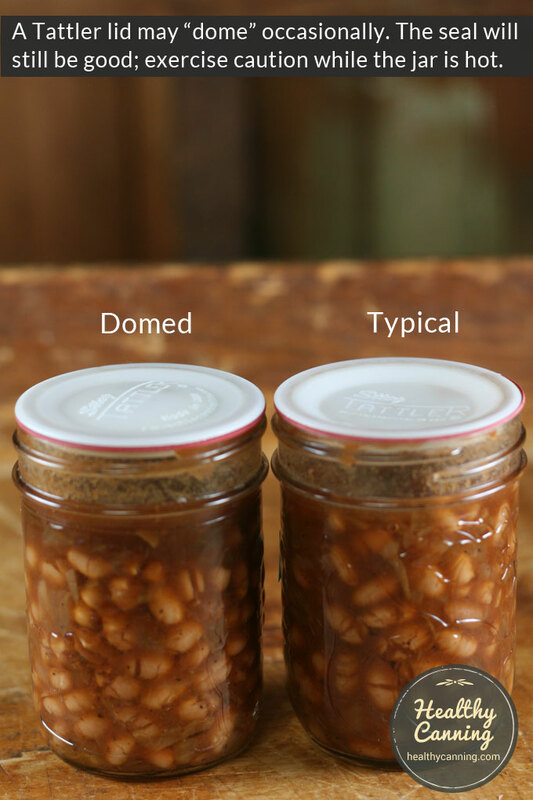 The same tightening allows the original version of the lid to vent, this is simply an extra measure for a margin of error in tightening for those who have difficulty grasping that correct ‘feel’.” Loren Stieg to HealthyCanning. Facebook PM conversation November 2016. THE FOLLOWING FINAL STEP IS CRUCIAL TO ENSURE A GOOD SEAL: Once the process is completed and the jars are removed from your canner, let the bubbling die down (approximately 5-8 minutes), as this is pressure still releasing from the jars. Place a towel over the still hot jars (for safety) and finish tightening the metal bands. Now, let your jars cool naturally and when cool to room temperature, remove the metal band and lift the jar slightly by the lid. It should be well sealed. Remove your metal screw bands and your food is ready for storing.” Tattler lids home page https://www.reusablecanninglids.com/, November 2016. As of spring 2015, there are no documented statistics about Tattler lid success rates; we only have word-of-mouth to go on. A few bloggers have tried to use Tattler lids and not got the hang of them and are consequently now vocal about not liking them. Far more people appear to have become enthusiasts after their second or third use of them as they became accustomed to using them, and report that they now encounter a higher rate of seal failures when they use the default “metal lids” that are currently the industry standard. 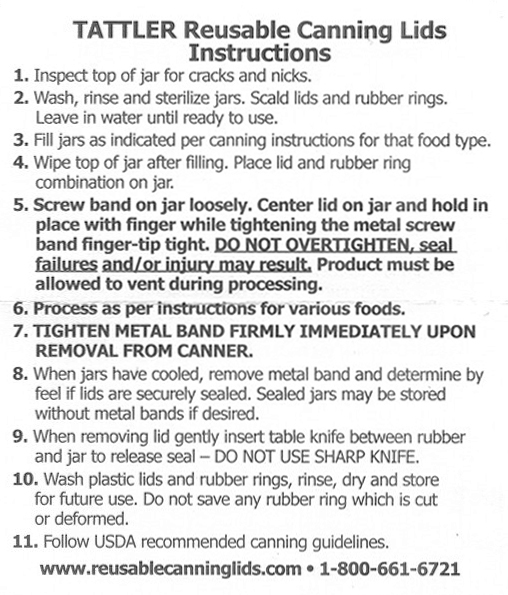 Lisa Rayner, author of The Natural Canning Resource Book (2010), doesn’t like or approve of Tattler canning lids, period, and writes that, “The National Center for Home Food Preservation has also documented higher levels of seal failure rates on Tattler lids than Jarden two piece lids”, (pp 60 to 61.) though without citing a source for that statement made in 2010, 3 years before the NCHFP began its study and documentation of Tattlers. Just before you are ready to fill your canning jars with your food product, set the number of white plastic discs and red rubber rings you will be needing into a big enough bowl, pan or measuring jug, and pour boiling water from a kettle over them to scald them. Do not, however, put them in a pot on the stove and boil them. Leave them in the water. Prepare your jars as usual — filling them, measuring correct headspace, wiping rims etc. Take a white disc and rubber ring out of the water (tip! the water may still be quite hot, so use something to fish them out with – your regular magnet wand for lids won’t work here!) Put the white disc upside down on the clean counter, put the rubber ring on it, then invert the assembled lid together onto a jar, centring it. Remove the ring bands, wipe the jars down, label and date and store as you normally would. As of 2015, Tattler has revised its recommendations for headspace. Previously the recommendation was to fill jars as indicated (as shown above.) Now, they are recommending a 1/4 to 1/2 inch (1/2 cm to 1 cm) additional headspace depending. Tattler Facebook Page. Accessed 25 October 2015. If it calls for 1 inch (2.5 cm), increase that to 1 1/4 inch (3 cm) for stuff with clear liquids, and 1 1/2 inches (4 cm) for stuff with thick sauces in it. 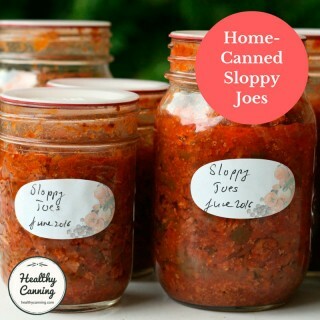 While the extra headspace can be a bit less important for items such as pressure-canned green beans or carrots, where the liquid is clear, the extra headspace is decidedly particularly important for viscous, thick-sauced stuff like applesauce, ketchup, baked beans, chili. The thick liquid on those items can get between the cracks of the gasket or lid, and stay here, and cause a seal failure. Don’t use too much headspace though: any lid, metal or plastic, can either fail to seal or lose its seal later on the shelf, because too much headspace means a weak vacuum. Here are two photos of two Tattler failures from the above two causes: not enough headspace in the case of the applesauce, and too much, in the case of the jar of mushrooms. Applesauce lid seal failure: insufficient headspace allowed sauce to bubble up over rims and prevent seals. Mushroom seal failure: too much headspace meant weak vacuum, leading to seal failure later on shelf. The “original design” lids came with the following guidance for how tightly they should be secured to the jars with the ring bands during processing. Much debate about how to interpret this this ensured over the years in the blogosphere. Others said to tighten the ring band, then loosen it by 1/4 turn. Or 1/4 inch. We were never able to locate any official source for the directions for taking a “finger-tight” Tattler ring band and loosening it by 1/4 inch or 1/4 turn. This directive did not seem to come from any official Tattler instructions that we ever saw. So it’s possible that a user somewhere just revived the old zinc lid advice, and promoted it for Tattlers. It is important after processing to ensure that the screw band is re-tightened to ensure that it remains snug during cooling. Rings can actually unwind and loosen themselves a bit from the pressure inside the jar as air vents out, and a snug screw band is required to clamp down both parts of the Tattler lid while the jar is closing. Put a cloth of some sort over the jar while you are checking the ring’s snugness, and have oven mitts on. Some people say that a solid advantage of using metal lids is that as soon as your canning processing time is done, you can turn off the stove burner and race out the door on an errand or for the evening, leaving everything to cool in situ. With Tattler originals, the directions are to re-tighten the ring bands at the end of processing while the jars are still very hot, so that entails hanging around for the cool-down process of the canner. 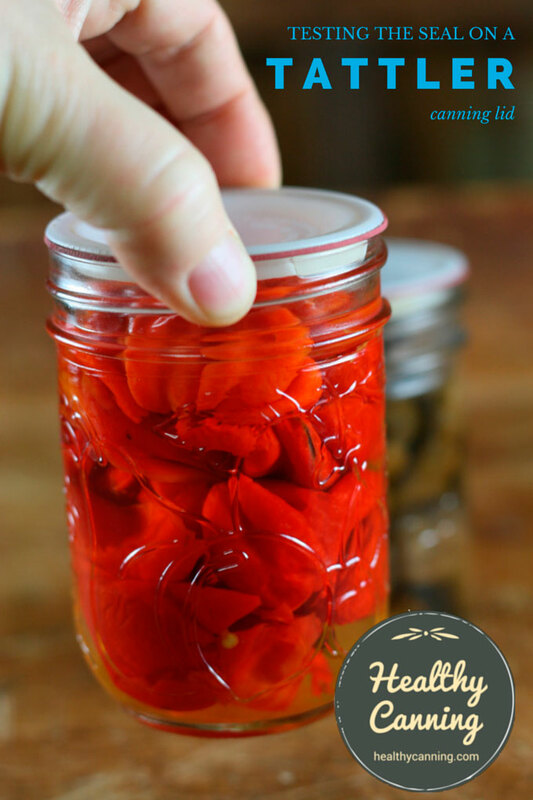 First, it should be noted that leaving jars in a canner, whether a water bath canner or pressure canner, is recommended against because it can lead to a type of food shelf spoilage called “flat sour.” So you want to avoid doing that at all costs. Secondly, some people have reported that they did leave Tattler lids in a pressure canner immediately after processing time was up and the burner switched off. When the canner was finally opened several hours later, every single Tattler lid was found to have sealed fine even without the intervention of the secondary ring band tightening. Occasionally you may see the centre of a Tattler lid “dome” upwards after processing. This is perfectly normal. In 99.9% of instances, the dome ends up going back down of its own accord as the headspace void inside the jar cools and contracts, producing a perfectly normal seal. In a few rare instances, it may mean that there’s a great deal of pressurized, trapped air in there. In February 2013, YouTube user 1952 Jeep posted a video entitled, “Tattler Lid Failure.” He had a Classic Design Tattler lid explode off the top of a hot jar fresh out of the pressure canner while he was doing the second post-processing tighten on the lid. Subsequently, he posted a video explaining why it happened (he had the ring band far, far too tight) which caused extreme pressure inside the jar. As well, subsequently, Tattler revised its second-tightening directions to include covering the jars with a tea towel and using oven mitts during this process. In his instance, the upwards bulge in the white plastic lid revealed an extreme amount of pressure. He had put elbow-power into tightening the ring band and tightened it beyond finger-tip tight. “[What happens when the metal lids crinkle, why does that happen?] Buckling. … different factors that can cause buckling. … if your band is too tight. So the whole purpose of the band is to simply act as a place holder, you put your lid on your jar, and then you adjust your band to fingertip tight, so if you do it too tightly, again you get too much pressure, that lid is going to buckle to try to release that pressure…”  Jessica Piper. Video: Canning Lids 101. 20:20. Accessed March 2015 at https://ball.yourbrandlive.com/c/lids/. 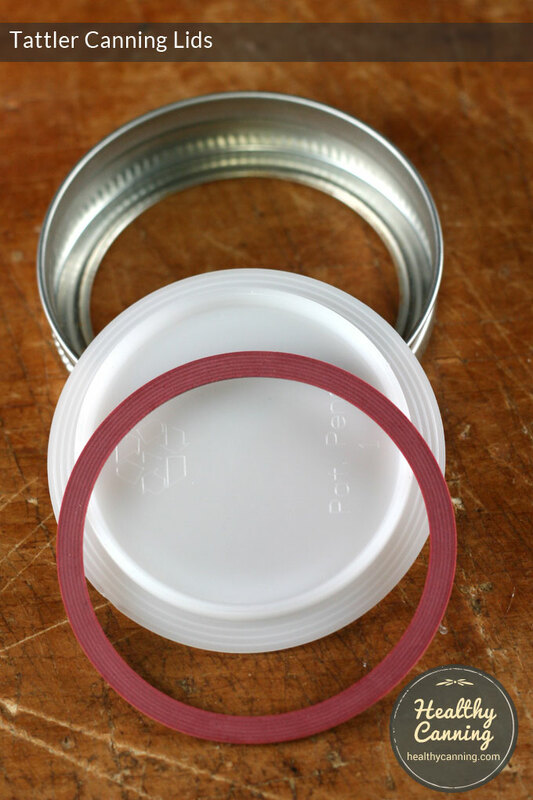 If you see that a Tattler lid has an upwards bulge in it when you take it out of the canner, use extreme caution in handling the jar and in tightening the ring band further. In fact, that jar might be a candidate for just leaving alone, as we’ve seen some users already routinely do anyway. It may be that because of the pressure in the jar pressing the lid against the ring band that no further tightening is needed: the ring band is probably already tightly connecting with the lid — it would have to be, to hold all that pressure in. It may be best just to set the jar down on your prepared cooling surface to cool normally with your other jars, and wait to see if you get a seal after 12 to 24 hours. You probably will. If a lid is convex it is because it was too tight going into the canner. When too tight they will not let pressure vent, but retain that pressure inside the jar and bulge the lid. Be careful if this happens, carefully set the jar aside to cool. This trapped pressure may very well have the metal band stressed to nearly coming off and any disturbance of the metal band could cause it to release. (Once cool it may seal. Even if sealed use this jar first since having to off set the pressure, proper vacuum may not develop). Using a previously bulged lid will not affect the sealing whatsoever. It will likely pull down and be normal once again. Please refer to the instructions for tightening in the top post in this column. Hope this clarifies. Loren C. Stieg – Tech Support.”  Lauren Stieg. Tattler Lid Facebook Page posting. 14 October 2015. Accessed 25 October 2015. To test for a seal with Tattler lids, you will not hear a metallic ping when they are sealed as you might with metal lids (note that a ping is not a guaranteed indication with metal lids, either), nor will you see the lid bulge downwards into the jar. There are no visual or audio indications. Instead you do a simple, do-or-die test that you should actually be doing with metal lids as well. When it’s time to remove the ring band from a jar, do so. Then, attempt to lift the jar by the edges of the lid a small amount off the counter — slowly and carefully and ever so slightly at first, with your other hand in the air just slightly under the jar to catch it in case of mishap. If you can raise the jar in the air by the edges of the lid, you have a guaranteed seal; and can rest easy. In fact, with a Tattler lid, because it is two piece you will often know you have a seal failure before you even get the ring band all the way off because with its being two pieces, one of the two pieces will usually start to slide around if there isn’t a seal. Sometimes when you take a jar with a metal lid out of storage in a hurry and pop the lid with an opener, the lid comes off so easily and with no “whoosh” of air, leaving you stopping in your tracks with doubt about whether that metal lid had actually truly been on or not, or just glued on a bit because of some food or syrup on the rim of the jar. With the Tattlers being two piece, that is far more unlikely to occur. A good strong vacuum seal needs to be present to hold both parts of the lid in place. Despite all your precautions and care, some of the food product did get wedged up between the rim and the rubber band, preventing a seal. With a Tattler lid, you can console yourself with at least one thing: even if a metal lid failed to give you a seal, it still counts as used and you have to toss it out. With a Tattler, you can use it again! Sometimes people put the canning rings on too loosely with Tattlers, allowing too much loss of liquid. LIQUID LOSS: Bringing the canner temperature up in increments instead of just setting a burner on high all at once seems to help. The canner water temp and the temp inside the jar need to rise as close together as possible to avoid siphoning. Just setting the burner on high will rapidly increase the temp inside the canner but the jars will reach that temp a bit slower which can be a negative factor. The same goes for decreasing the temp at the end of the cycle. Instead of simply turning the burner off bring it down a bit slowly to let the jar temp decrease along with the canner stabilizing the jar temp instead of a rapid differential…. We have found that following the Pressure canner manufactures recommendation of letting a steady stream of steam escape for a full 10 minutes before placing pressure regulator on, may also help prevent liquid loss.”  Tatter Lids Facebook Page posting. 14 October 2015. Accessed 25 October 2015. People who stick paper or tape labels onto the sides of their jars may never ask themselves how to label a jar with a Tattler lid on it. People who were used to writing on the disposable metal lids likely will, however. Some people write on Tattler lids using Sharpie pens (such as the Sharpie Rub-a-Dub Laundry Marker), and to remove the writing, they use a cotton ball moistened with nail polish remover (aka acetone) or a Mr. Clean eraser or 91% rubbing alcohol. (The 50% and 70% will have little or no effect on the Sharpie marks.) Afterwards wash the lids as you usually would and they are ready for another re-use. The round end of an old-fashioned can opener works well in getting Tattler lids off firmly but gently. Tattler also sells special openers. 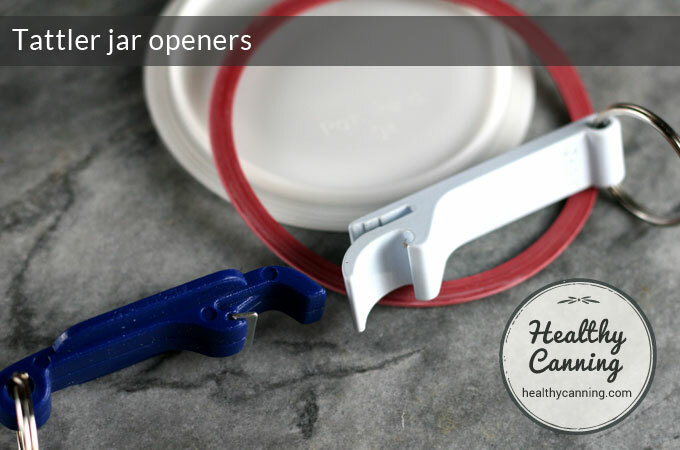 The special openers though can be trickier to use as the bottom lip on them can have difficulty finding a purchase between the rim of the jar and the Tattler lid. You can also use the back of a spoon to get the lids off. Tattler makes 2 different models of jar openers: one has a thin metal lip on it, which some may find easier to work with. You just want something that won’t put nicks or cuts in the rubber rings, or chip the white plastic disk. Try opening the jar sober next time! When you give someone a jar of your home preserves with a metal lid, the thought of both ending up in recycling can be annoying. When the jar also involves a Tattler lid, the annoyance factor can increase just that much more. 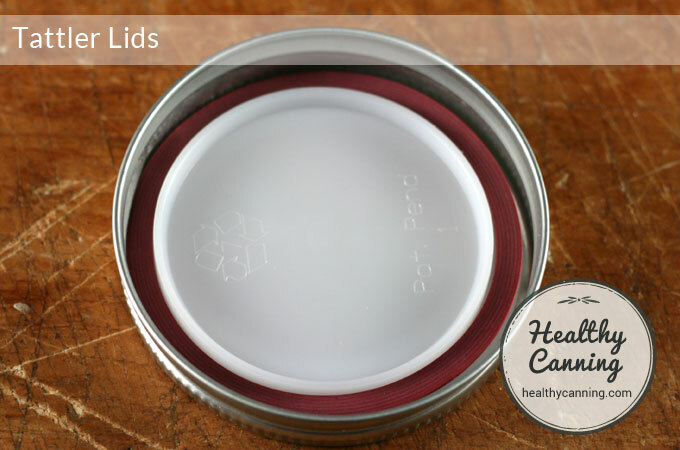 Sharon Peterson of Simplycanning.com has started to collect ideas about how to make sure Tattler lids on gifts find their way home. … we recommend flipping the rubber rings when reusing & having the smooth surface always touching the lid itself. 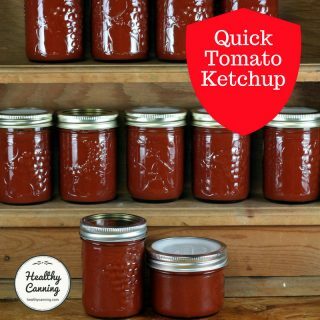 The lid has sealing grooves on it & placing the smooth surface of the ring next to the lid will help to prevent cross threading.” Tattler to Healthy Canning. November 2016. Facebook messenger service. However, we note that if you examine the red rubber ring gaskets brand new out of the box, there is no smooth side. Both sides start life with slight grooves on them. Some food products such as tomatoes and preserves with turmeric, curry powder, etc, in them may slightly colour the undersides of the white lids. Such stains usually wash off, or fade out over time and with repeated use. Do not bleach the lids as it will weaken the plastic. A few users have pointed out that any slight stain on the underside really shouldn’t be a worry because there shouldn’t be anything living in your jars to be looking up at the lid anyway. Note that Tattler lids are immune from pinholing. Consequently, if you have Tattlers, they could be a good choice for food items such as rhubarb and salmon, which are prone to pinholing. They are also immune to rusting and corrosion on the shelves, which could make them a good choice for damper or humid storage environments. 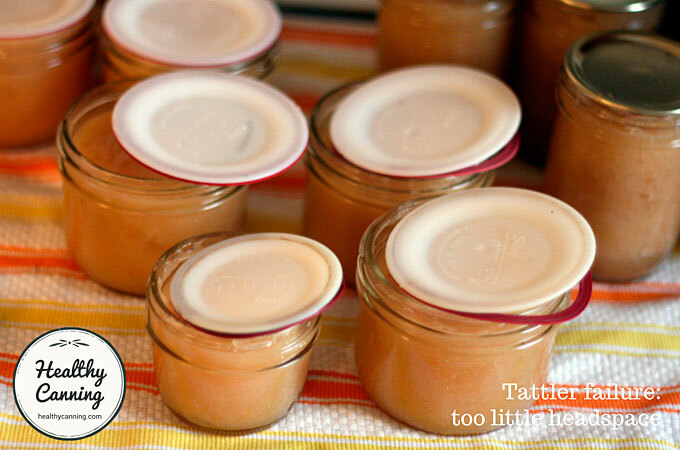 If you are nervous at first about getting the hang of Tattler lids, you could try them with something like a batch of jam or apple sauce — something that, if your jars don’t seal, you can simply freeze the product. Or, can some water. Applesauce in 125 ml / 4 oz jars: As applesauce can be viscous, it can provide a challenge to Tattlers when canned in 125 ml / 4 oz jars. Those size jars still have to be canned at the processing time for larger jars, which causes boil over. We’d recommend using the metal lids if you are trying to can applesauce in those size jars. Blueberries in 250 ml / 1/2 pint jars: Leave 3 cm / 1 inch headspace in those size jars when canning plain blueberries with Tattler lids. Soups: When making the USDA Soup or Ball’s Beef Stew, leave 4 cm (1 1/2 inches) headspace. Otherwise, any herbs or fat in the soup make boil up and onto the rim, preventing a seal. 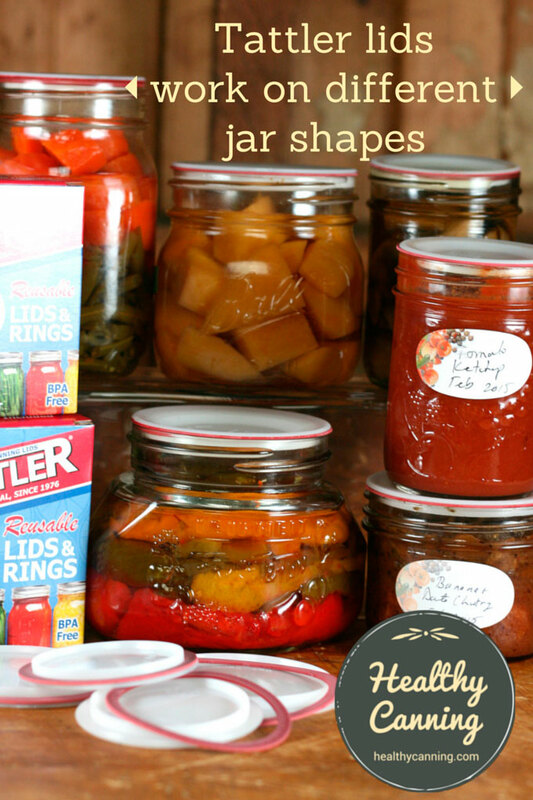 Tattler lids work on different jar shapes and makes: it’s the mouth size that counts. In North America, Tattler lids fit all current Jarden company jars (Ball, Bernardin, Golden Harvest and Kerr), as well as most historical brands such as Atlas, Consumer’s Glass, Dominion, etc., but they will not fit Gem jars. The neck of the jar needs to have screw rings on it to accommodate a screw band that corresponds in size to one of the two sizes immediately above. Wide-mouth (86 mm) Tattler lids will fit the wide-mouth Agee jars. Regular-mouth (70 mm) Tattler lids will fit Kilner Preserve Jars: those are the type of Kilner jar which takes the metal screw top bands. Tattler lids on Kilner jars. Wide-mouth (86 mm) Tattler lids will fit Leifheit preserving jars of the following sizes: .5 L, .75 L and 1 L. Note: not the small .25 L jam jar. Quattro Staggioni jars are made similar to Mason jars, but with one-piece, single-use screw-on metal lids. These lids can apparently be replaced with regular and wide-mouth metal lids and ring bands. Healthycanning.com passes the following information along with the qualification that we haven’t had occasion to double-check it yet (spring 2015): a user on Linda Ziedrich’s preserving site has said that Tattler lids can be used on some, though not all, Quattro Staggioni jars. The USDA never officially endorses any particular product. They make recommendations for, and occasionally, against. Dr Elizabeth Andress, head of the National Center for Home Food Preservation, said in a 2013 webinar the USDA recommendations are currently based on the two-piece metal lid system simply because they have a body of research documenting how well they work; they don’t have enough experience yet with other lid systems to endorse them the way they have the two piece metal lids. To clarify, the position is: they are currently neither for nor “agin” them. There is no warning against them. It’s just that, at this point in time, they can’t put forward a positive use recommendation that they could stand behind. A study on Tattler lids began in 2013 at The National Center for Home Food Preservation. 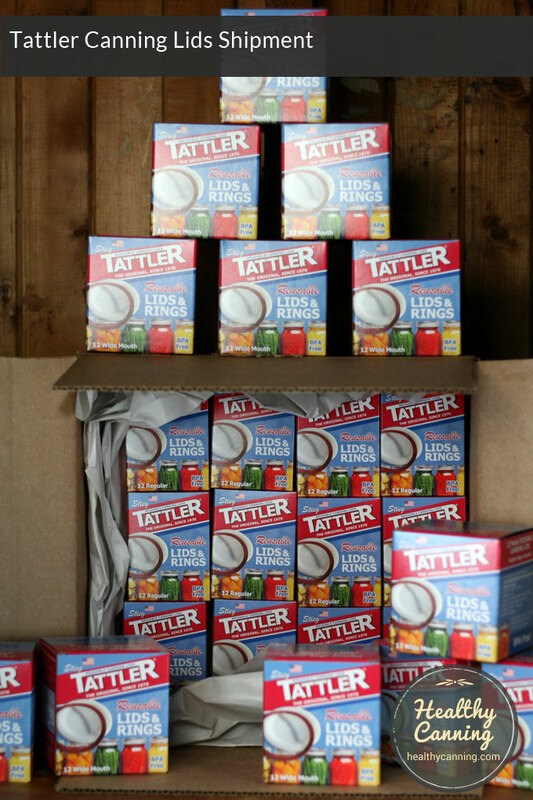 I wanted to let you know we are about to get more experience with using Tattler lids. I have a graduate student who will be starting a project to use them in canning some boiling water and pressure canned jars of food to look at sealing success rates, vacuums and maintenance of vacuum during storage periods. We will incubate some of the jars to see if there are any differences in food quality such as discoloration at the tops of jars, also. The comparison will be to the traditional two-piece metal lid system as well as some products packed in Weck jars also.”  National Center for Home Food Preservation to Tattler lids. Cited in Facebook post of 31 December 2012. Accessed May 2015. “There is research underway at the University of Georgia to determine whether we can recommend the use of these lids in the future…. Later this year, Barb hopes to be able to share information based on research-testing of the Tattler lids.” Ingham, Barbara. Is it safe to use re-usable canning lids? In: Working for Wisconsin Families. University of Wisconsin Extension. Sept / Oct 2014. Page 1. Tattler lids were invented in 1975 by Loren Stieg, a tool and die maker in Michigan, and first brought to market in 1976. The name “Tattler” came about because Loren Stieg wanted them to make a sound when they sealed. “They were going to make a noise and ‘tattle’ on themselves when they sealed,” Stieg said. “It just didn’t work that way and the design changed, but the name stayed.”  McIntyre, Erin. Wait! Don’t throw away that canning lid. Loren had a tester in his mother, Dorothy, who was a life-long enthusiastic and prolific home canner. She’s the woman in the black and white promo picture that the company still uses of a woman in her basement pantry. McIntyre, Erin. Wait! Don’t throw away that canning lid. [Loren Stieg] estimates a price of $1.50 per dozen as against a current maximum of 60 to 70 cents per dozen for the metal models. Like the metal ones. Stieg’s plastic lid requires a rubber gasket. He plans to include the gaskets in a pack of lids then charge 20 or 25 cents per dozen for extra ones. Stieg is already at work on a self-sealing lid that would eliminate the need for gaskets. His wife, Petty, who is also his secretary in the tool and die business, has used one of the lids five times without a problem. And they make a good seal, the Stieg’s claim. One was sealed to a jar for six weeks “and it was so tight we had to pry it off,” he said. In another test, they boiled lids and immediately dropped them in ice water with no harm….. The plastic he uses is “better than nylon” and tougher than most other plastic materials. It will not stain or deteriorate. And Stieg isn’t worried about the price of his raw materials. Unlike many plastics which are derivatives of oil, the inventor says his material is made from a waste byproduct of natural gas.”  Pritchard, Bill. His aim: put lid on crisis. Traverse City, Michigan: Traverse City Record-Eagle. 20 September 1975. Page 1. Loren Stieg is about to seal his place in the canning lid industry. Stieg, who has a small machine shop on West Silver Lake Road, is beginning production today on a plastic canning lid he has invented. The lid is different from the common metal type in that it can be re-used many times, the inventor said. Spartan Stores have ordered a “real good order” for statewide distribution of both the large and regular sizes of the lids, Stieg said. He said the order is “in the neighborhood of” 360,000 or more of each lid size. Jack Kroon, buyer for Spartan Stores headquarters in Grand Rapids, said he would “just as soon” not disclose the size of the order, but added that “it’s going to be interesting” to see how well they sell. Kroon said the lids are expensive compared to the metal kind, but reusable and the future should show whether the reusability makes up for the higher price. The lids will retail for $1.49 to $1.59 per dozen, he said. The invention comes at a time when “lids are going to be in pretty short supply” as they have been for some time, the buyer said. Local stores will also carry the new product, Stieg said. Stieg is calling his product the “Tattler” — after the loud snap they make when they seal. The lids are used with rubber rings, like regular metal lids, which can also be re-used if they are properly handled, he said. He has been developing the lid for nearly one year. Distribution is scheduled, for either the end of this month or the first two weeks of February — Stieg is figuring on the first part of next month. “I’m sure looking forward to getting this thing off the ground,” the inventor said. Jar lids go into production. Traverse City, Michigan: Traverse City Record-Eagle. 19 January 1976. Page 1. The lid first hit the market in March 1976. One of the busiest booths in the recent [Ed: March 1976] Traverse City Home Show was the display of Tattler Reusable Canning lids, developed by LOREN STEIG, owner of a local tool and die business. 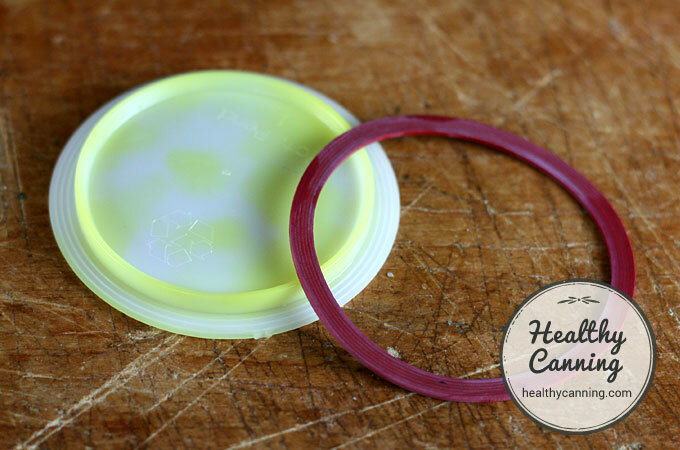 Used with a separate rubber ring, which is also reusable, the plastic Tattler lid offers a solution for the home canner faced with recurring shortages of lids. The new lid went on sale in local stores March 12 to coincide with its introduction at the home show. Shipments to stores throughout Michigan commenced March 15, to be followed by shipments to stores in Ohio, Indiana and Illinois. “We are going to proceed cautiously with our distribution so as to be sure we can supply the needs of our customers throughout the canning season,” Stieg says. “We don’t want to get people excited over our lid and then let them down when they need it the most,” he added. Stieg projects a volume of $1,000,000 for the year. “This is less than 1% of the total market, but nevertheless, a nice addition to the industrial base of Traverse City,” he commented. 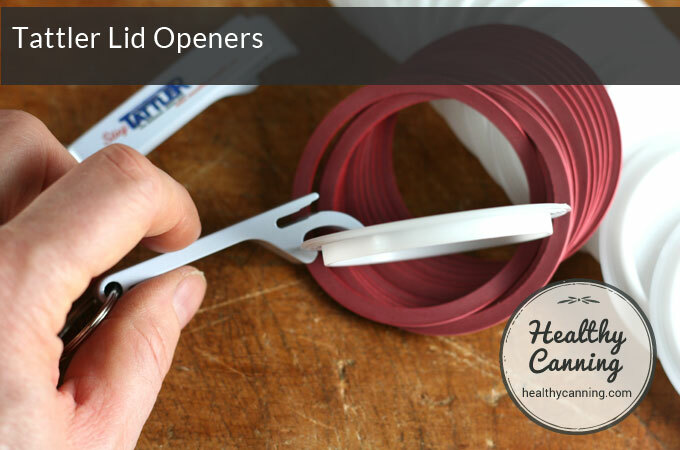 The Tattler lid is higher in price than the single use metal lids. But visitors to the home show, as judged by their comments, according to Steig, were nearly unanimous that the reusable qualities of the Tattler lids and rings were well worth the initial investment. Newsmakers. Traverse City, Michigan: Traverse City Record Eagle. 18 March 1976. Page 23. 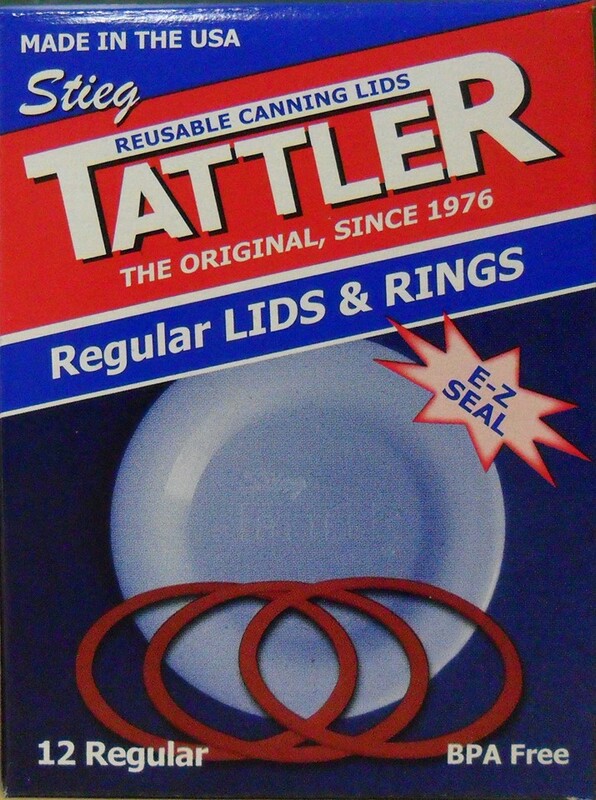 Between the 1970s and the 2000s, not many people heard about Tattler lids, as they were a very small company without the capacity to promote their product broadly. With the advent of the Internet, they were able to start generating better publicity about their product. Loren’s son, Brad Stieg, took over the presidency of the company and rebooted the business in 2010 with a new corporation. The actual company name is S&S Innovations, Corp. dba (doing business as) Tattler Reusable Canning Lids. Keeping the original branch of the company in Reed City, Michigan, he also set up a second branch for manufacturing in Grand Junction, Colorado. In that year, they sold four times more than they had hoped for, and in 2011, sales quadrupled again. 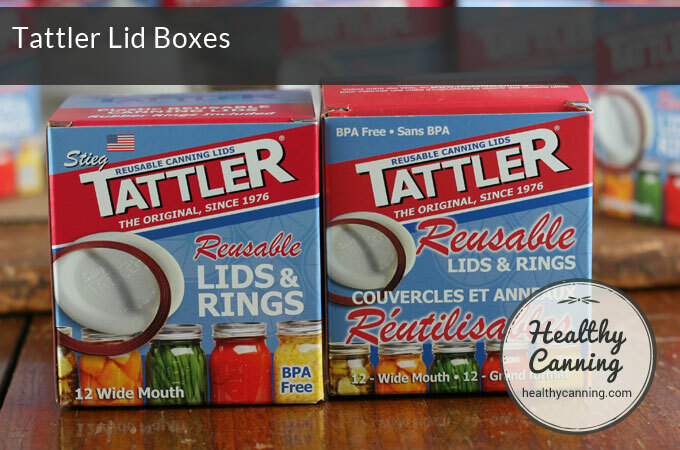 In 2013, Tattler lids were introduced nationally into Canada through the Canadian Tire store chain, which had the Tattler box translated into bilingual French and English for the Canadian market. In 2016, Tattler centralized its operations back in Michigan. Brad went off to pursue other ventures, and Loren stepped back in as President and CEO of the company. Loren sent us a note in 2017 saying, “I am still alive and very well at 75 and work in the company daily.” Loren Stieg to Randal Oulton via FB. August 2017. McIntyre, Erin. Wait! Don’t throw away that canning lid. Grand Junction, Colorado: The Daily Sentinel. 14 April 2012. https://www.gjsentinel.com/special_sections/articles/west-life-wait-dont-throw-away-that-canning-lid (Link valid as of May 2015). Castle, Phil. Business puts a lid on it. Grand Junction, Colorado: Business Times. 22 Feb 2012. (Link valid as of May 2015). Peterson, Sharon. Interview with Brad Stieg of Tattler Reusable Canning Lids. 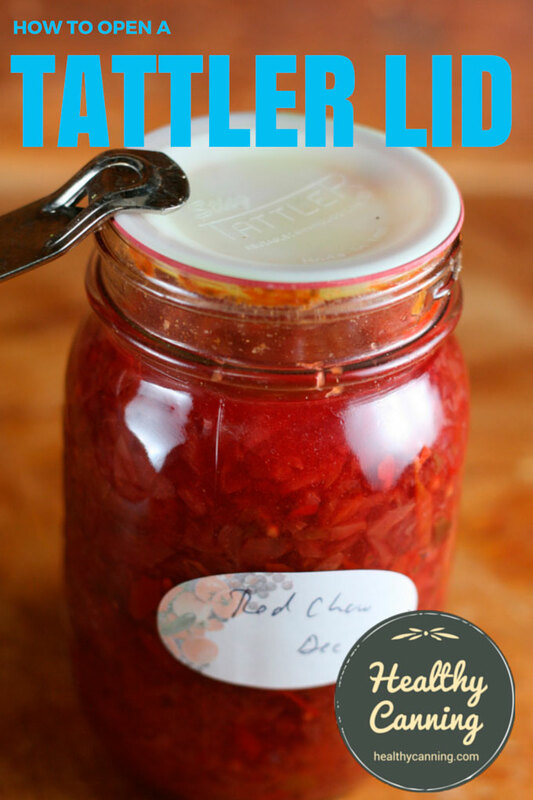 Accessed May 2015 at https://www.simplycanning.com/tattler-reusable-canning-lids.html . Launch of new design of Tattler lids. 2014 video narrated by the original creator of Tattlers, Loren Stieg. We really only recommend our shop site or approved vendors. We do not sell to Amazon sellers… We only stand behind what we sell or our approved vendors sell.” Tattler Lids to HealthyCanning. Facebook conversation in PM. July 2016. Tattler does not currently approve of Tattler lids being sold via Amazon. If you buy them via Amazon, Tattler is clear that you are buying them from Amazon at your own risk. Nor do they approve of Tattlers being sold by vendors which haven’t received explicit approval to do so. If you do purchase from “unauthorized” third-parties, Tattler warns that you may run the risk of being sold the older style lids, even if you are after the newer E-Z Seal design. Or, even used lids. If you are not certain if someone is an approved vendor, take a minute to ask first on the Tattler Facebook page. As of fall 2016, there is just one officially approved supplier for Canada that we know of; however Tattler says they will also ship directly to Canada via United States Postal Service. Tattler to Healthy Canning. November 2016. Facebook messenger service. There is no officially approved supplier for New Zealand as of fall 2016; however Tattler says they will ship directly to New Zealand via United States Postal Service. 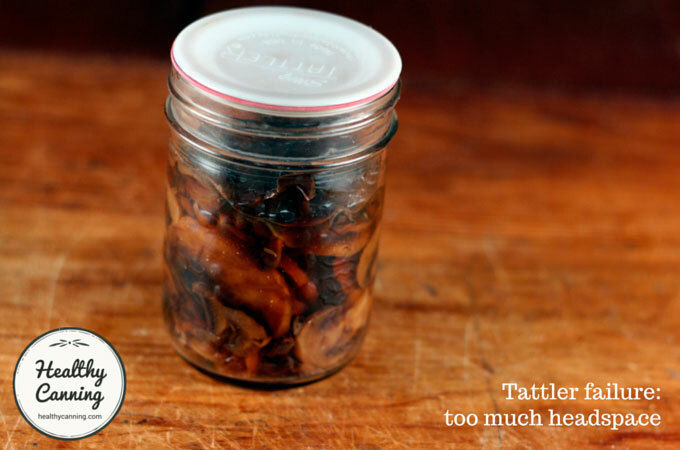 Tattler to Healthy Canning. November 2016. Facebook messenger service. There is no officially approved supplier for Australia as of fall 2016; however Tattler says they will ship directly to Australia via United States Postal Service. 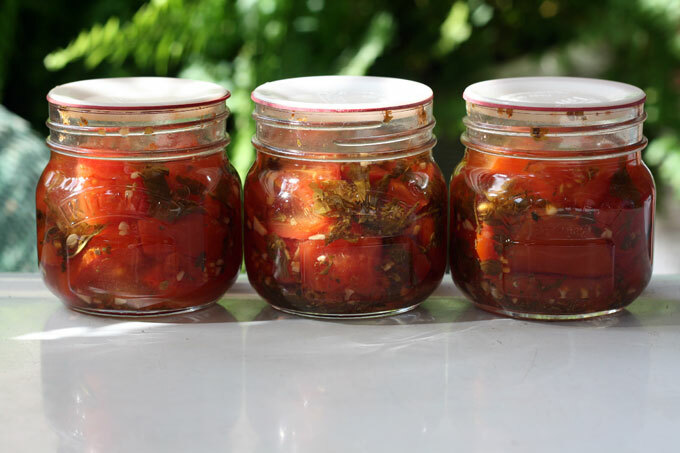 Tattler to Healthy Canning. November 2016. Facebook messenger service. For what it’s worth, we’ve seen people report on FB that ordering direct from the States from Australia worked out to be faster and cheaper than ordering within Australia. There is no officially approved supplier for the UK as of fall 2016; however Tattler says they will ship directly to the UK via United States Postal Service. Tattler to Healthy Canning. November 2016. Facebook messenger service. TO BE CLEAR: Tattler actively disapproves of Tattler lids being sold via Amazon. If you buy them via Amazon, Tattler is clear that you are buying them from Amazon at your own risk. Nor do they approve of Tattlers being sold by vendors which haven’t received explicit approval to do so. If you do purchase from “unauthorized” third-parties, Tattler warns that you may run the risk of being sold the older classic lids, or used lids even, even if you are after the newer E-Z Seal design. Tattler says they will ship directly to you anywhere in the world via United States Postal Service. Tattler to Healthy Canning. November 2016. Facebook messenger service. 5, 7. ↑ Loren Stieg to HealthyCanning. Facebook PM conversation November 2016. 8. 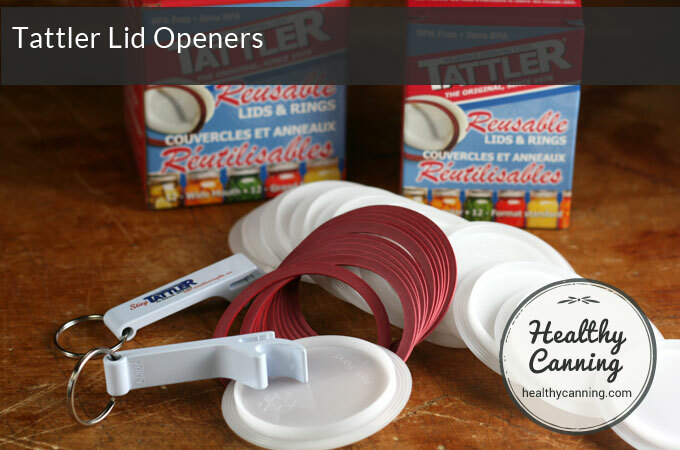 ↑ Tattler lids home page https://www.reusablecanninglids.com/, November 2016. 11. ↑ Tattler Facebook Page. Accessed 25 October 2015. 16. ↑ Jessica Piper. Video: Canning Lids 101. 20:20. Accessed March 2015 at https://ball.yourbrandlive.com/c/lids/. 17. ↑ Lauren Stieg. Tattler Lid Facebook Page posting. 14 October 2015. Accessed 25 October 2015. 19. ↑ Tatter Lids Facebook Page posting. 14 October 2015. Accessed 25 October 2015. 21, 37, 38, 39, 41, 42. 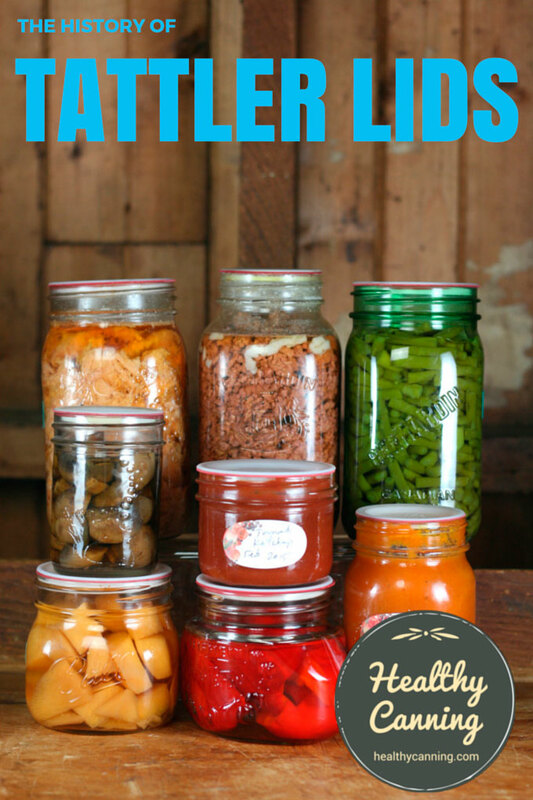 ↑ Tattler to Healthy Canning. November 2016. Facebook messenger service. 28. ↑ National Center for Home Food Preservation to Tattler lids. Cited in Facebook post of 31 December 2012. Accessed May 2015. 29. ↑ Ingham, Barbara. Is it safe to use re-usable canning lids? In: Working for Wisconsin Families. University of Wisconsin Extension. Sept / Oct 2014. Page 1. 30, 31. ↑ McIntyre, Erin. Wait! Don’t throw away that canning lid. 32. ↑ Pritchard, Bill. His aim: put lid on crisis. Traverse City, Michigan: Traverse City Record-Eagle. 20 September 1975. Page 1. 33. ↑ Jar lids go into production. Traverse City, Michigan: Traverse City Record-Eagle. 19 January 1976. Page 1. 34. ↑ Newsmakers. 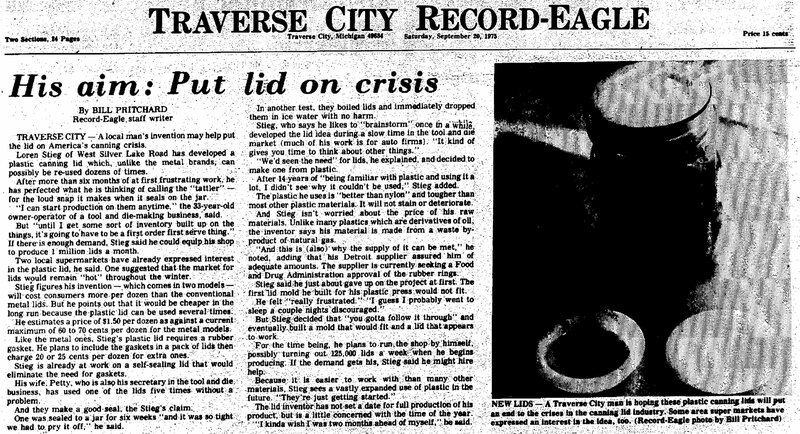 Traverse City, Michigan: Traverse City Record Eagle. 18 March 1976. Page 23. 35. ↑ Loren Stieg to Randal Oulton via FB. August 2017. 36. 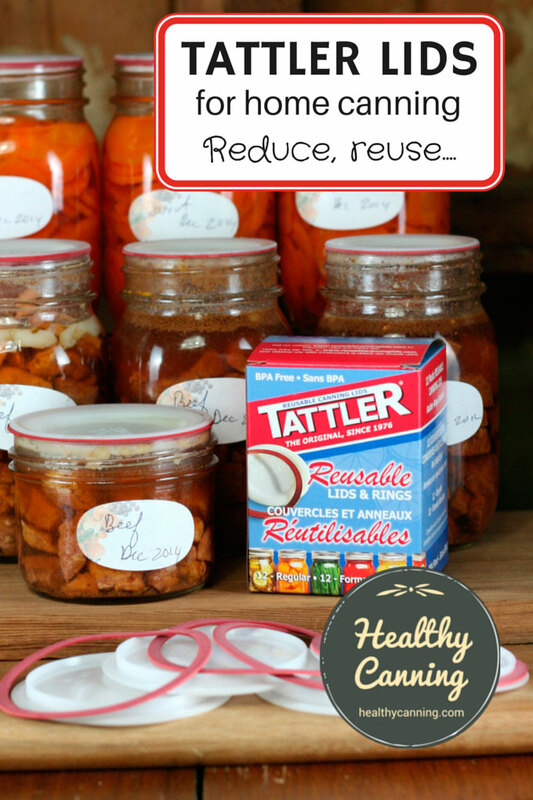 ↑ Tattler Lids to HealthyCanning. Facebook conversation in PM. July 2016. Gosh…Thanks for the in-depth post ! I sure learned a lot about Tattlers ! I love them for pressure canning ! 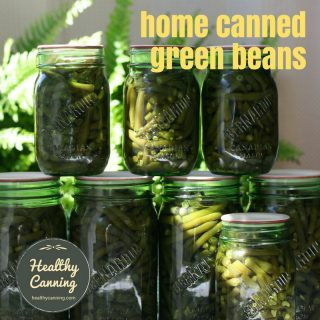 I’ve shared thispage with a FB group called We Might Be Crazy But We Aren’t Stupid Canning And Preserving. The only part you are missing is related to “fake Tattler lids” being sold on Amazon. They are not fake lids, they are exactly the same, from the original molds, but they are being produced by Tattler Home Produts, also located in Reed City, Michigan. The reason is for this is the son sold out of the company several years ago. Shortly after, the new “partners” could not see eye to eye and split the company in two, creating two entities manufacturing, marketing, and selling the same product. That is why the “new” ez seal design was rushed to market in a different color, so it can be easily distinguished from the “original” design being produced by the former partner/ current competitor. It’s also easier to spread the false narrative about “fake” lids. The reality is two different companies are producing Tattler lids, and neither will support or guarantee purchases made from the other. Bottom line though, they are all the same lids. Great article, it had all the details I wanted about Tatler lids. Also +100 points for the foot notes, exceptional! You really should get them to link to your page as it’s far more useful and thorough than the information they provide on their page.